It's been a long time coming, but real estate in Tallahassee is finally showing signs that we are going to break away from the housing market bottom. We projected significant improvement for this year in our 2013 Real Estate Forecast, and the earliest signs suggest that we were correct. The real estate graph above shows that the current trend of daily home sales is nearly equal to the level that was artificially achieved during the Homebuyer Tax Credit run in 2010. Sure, there are still all the upside down homeowners who won't bite the bullet to sell a home this year, but the demand side of the market is finally starting to arrive. Currently, there are more than 1,700 homes for sale in Tallahassee, but buyers are finding that the number of selections is much more like "normal" than anything we've experienced in the past six years. The supply and demand for real estate in Tallahassee is still leaning towards the buyer, but nearly so skewed as we have grown used to. The graph below shows eleven years of the daily closed home sales trend. Note the gold line that shows our historically "normal" rate of sales, and how we still lag that level by quite some bit. 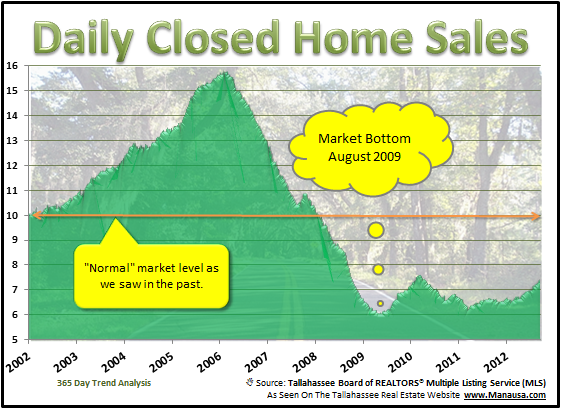 The graph also shows the real estate market bottom that was established in August 2009, and hopefully this current trend will rise high enough to know that real estate in Tallahassee is returning! If we look around the State of Florida, we find that most markets are a few years ahead of us in the recovery. Of course, they hit tough times before us, so we're just going through what they've already experienced. This "trailing" effect gives those of us who really study real estate in Tallahassee the advantage of limited foresight in regards to the recovery. And based upon what we are seeing, we should expect the Tallahassee real estate market to divide over the next twelve to eighteen months. Homes priced below $200,000 will be heading into a sellers market, while homes above $300,000 will remain in a buyers market for many, many years. The overbuilding in the higher end occurred in most markets, stimulated by loan programs that will not exist again. The one variable that we cannot forecast with any accuracy is just when interest rates will move to higher ground. When this occurs, it will add additional pricing pressure to those over-supplied, higher end homes. If you want to know more about how to take advantage of the opportunities in real estate in Tallahassee, just drop me a note and we can schedule a time to explore your specific options and opportunities.